What's this? 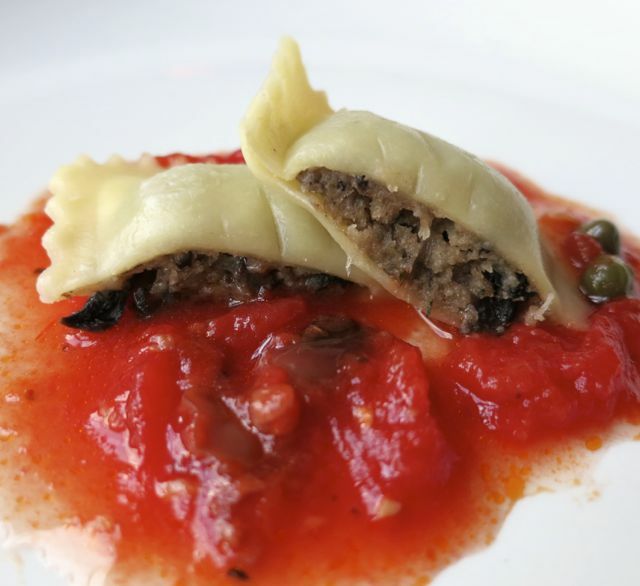 A locally made vegan ravioli?! Yes, please. 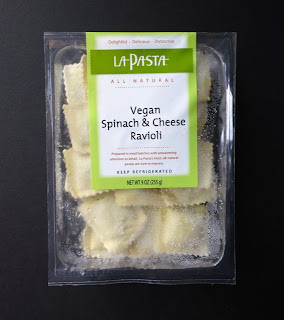 La Pasta, the Silver Spring, MD-based fresh pasta company, contacted me to see if I'd like to try the four flavors of their new-ish vegan ravioli. I said, "Come on down!" La Pasta has been producing distinctive pastas and pasta sauces for more than twenty years. The company began production as a small artisinal pasta maker operating within the DC-metro area. 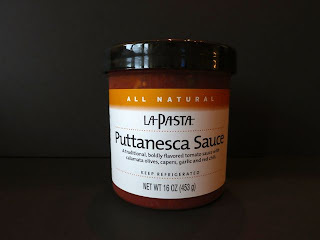 After having won approval from leading foodservice and fine food retailers in the region, La Pasta's reputation and sales spread throughout the Mid-Atlantic region. Now with their new vegan and gluten-free lines of raviolis (these are two distinct lines), they are hitting an entirely new market. 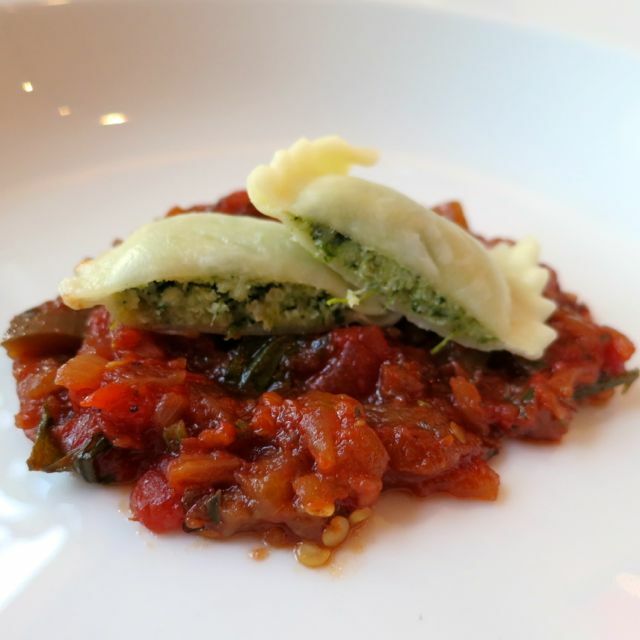 So, I put their vegan raviolis to the test. My absolute favorite was the Vegan Spinach & Cheese! These soft pasta shells were filled with spinach sauteed with garlic and sweet nutmeg and blended with a mix of vegan ricotta and mozzarella cheeses. It was the perfect balance of spinach and vegan cheeses and tasted excellent with the Puttanesca Sauce. Speaking of the sauces, boy are these good! They gave me two of them to try and I honestly couldn't pick one over the other. The Puttanesca was incredibly flavorful and loaded with fresh vine-ripened tomatoes, basil, olive oil, kalamata olives, capers and garlic. The Eggplant Sauce is just as amazing and is thick enough to stand alone as a caponata. With oven-roasted eggplant, caramelized onions, and Italian-style tomatoes, you really can't go wrong with these sauces. Okay, back to the ravioli. My next favorite was the Vegan Mushroom Ravioli shown with the Puttanesca sauce. With its mix of crimini mushrooms, onions, bread crumbs, parsley and thyme, this ravioli is sure to please any mushroom lover. 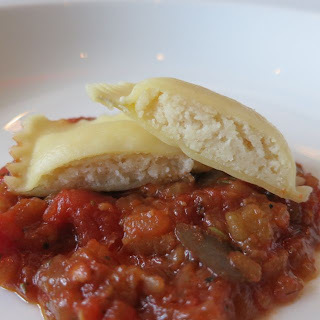 The Vegan Cheese ravioli (shown with the Eggplant Sauce) was also very good, but I like to have more in my ravioli than just cheese, which is the only reason why this one falls to the number three spot. It is great if you are a big fan of just a simple cheese ravioli. It also uses a mix of vegan ricotta and mozzarella cheeses just like the spinach and cheese ravioli. Lastly, I enjoyed the Vegan Artichoke & Spinach as well (shown with the Eggplant Sauce), but it didn't shine in the ways that the others did. Despite its name, it also has cheese in it and perhaps they just tried to fill too many flavors in these tiny little raviolis. When I asked if they were GMO-free, they stated that they are working on it. They use Eden Soy Milk, which is organic and, therefore, Non-GMO. They also use Teese vegan cheese, which is Non-GMO. The only thing they are unsure about is the Tofutti cheese, which is not yet Non-GMO Project Verified, but is working to obtain this certification in the future. La Pasta has committed to becoming GMO-free and has stated that they will be doing whatever they need to do to obtain Non-GMO Project Verification in the future. 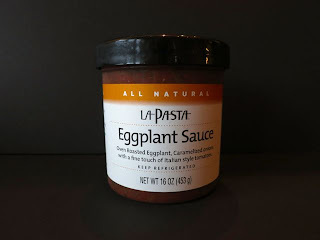 So if you are seeking a fantastic line of raviolis and sauces, check your DC-area Whole Foods or other small grocers like Roots Market, MOMs Organic, and Relay Foods as well as many co-ops like the ones in Bethesda and Silver Spring. You will also find them at select retailers in NJ, NY, CT, and PA. The raviolis sell for $6.99 and the sauces sell for $5.99, both in the refrigerated section. My mission is to find out where they are in DC! Yum! How exciting! I love some vegan raviolis! Nice to see a new product though! Whoa, these flavors all look so good. I usually get the vegan ones from Rising Moon (I think that's the name), but I will have to keep an eye out for these. Read this yesterday and immediately wanted to know if they make vegan tortellini. Thanks for writing this! 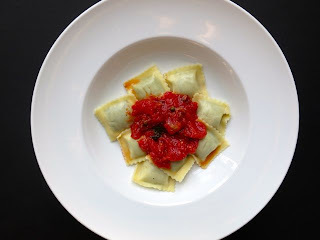 At this time, I think they are only making vegan raviolis, but I'll let them know of the request! We currently only manufacture these four vegan raviolis. We will consider a vegan tortellini for the future. Thanks!